Eat more fish for a better night’s sleep. Most fish—and especially salmon, halibut and tuna—boast vitamin B6, which is needed to make melatonin (a sleep-inducing hormone triggered by darkness). Place salmon pieces, skin-side down, on the prepared pan. Season with salt and pepper. Combine sour cream, mustard and lemon juice in a small bowl. Spread evenly over the salmon. Broil the salmon 5 inches from the heat source until it is opaque in the center, 10 to 12 minutes. Serve with lemon wedges. 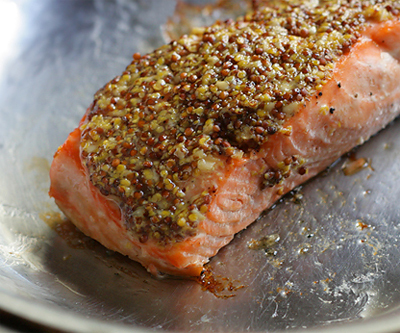 This entry was posted in Entrees, Metabolic Medical Center Recipes, Modified Profast (Fast and Flexible) Recipes, Seafood and tagged easy, fast, healthy, lemon, Metabolic Medical Center Recipes, mustard, mustard crusted salmon, salmon, sour cream by foodies4mmc. Bookmark the permalink.